The Los Angeles Angels head to Comerica Park on Saturday to take on the Detroit Tigers. The probable pitchers are Jhoulys Chacin for the Angels and Michael Fulmer for the Tigers. The opening line for this game has Los Angeles at +199 and Detroit at -215. The over/under is 9. The Angels have a 58-64-5 over/under mark and a 61-66-0 run line record, meaning they cover 48% of the time. The Tigers are 70-57-0 against the run line and have a 64-57-6 over/under record. They cover the spread 55% of the time. The Angels head into this game with a 54-73 record, and they are 25-40 on the road. Starting pitcher Jhoulys Chacin has a 4-8 record with an ERA of 5.61 and a WHIP of 1.53. He has 84 strikeouts during his 109 innings pitched and he has given up 123 hits so far this year. He has surrendered 10.2 hits per 9 innings and he has a FIP of 4.38. The bullpen this season has an earned run average of 3.91 and they have allowed 405 base hits on the year. Teams are hitting .249 against the pen while they've been struck out 341 times and walked 143 times this year. As a unit, Los Angeles has given up 7.79 base hits per nine innings while striking out 9.19 hitters per nine. They are 6th in the Majors in team earned run average at 3.78. The Angels pitchers have collectively given up 1,186 base hits and 565 earned runs. They have allowed 169 home runs this season and they allow 1.4 homers per nine innings as a staff. Los Angeles as a pitching staff has walked 392 batters and struck out 883. They walk 3.2 men per 9 innings while striking out 7.1 per 9. They have a team WHIP of 1.42 and their FIP as a unit is 4.71. As a team, Los Angeles is hitting .251, good for 19th in the league while putting together a .255 average on the road. The Angels have a .414 team slugging percentage and an OBP of .321 which is good for 18th in the league. They rank 19th in baseball with 8.58 hits per contest. Kole Calhoun comes into this game hitting .268 and his on-base percentage is at .351. He has 126 hits this season along with 75 runs scored and 57 runs batted in. He's struck out 94 times and has walked 59 times. Mike Trout is hitting .316 and he has an on-base percentage of .432. He has totaled 139 hits so far while scoring 97 runs and he's driven in 82. He has walked 87 times and has struck out 108 times. The Angels have 1,129 hits, including 214 doubles and 121 home runs. They've stolen 46 bases while they've been thrown out stealing 27 times. Los Angeles has walked 373 times this season and they've struck out 761 times as a unit. They've left 823 men on base and have a team OPS of .731. They score 4.46 runs per contest and have scored a total of 566 runs so far this year. Detroit comes into this game with a 35-26 home mark and a 68-59 overall record. With an ERA of 2.58, Michael Fulmer has a 10-4 record and a 1.06 WHIP. He has 104 strikeouts over the 125.2 innings he's pitched during which he has given up 100 hits. He has allowed 7.2 hits per nine innings and his FIP stands at 3.66. So far this season the bullpen has an earned run average of 4.31 and they have given up 403 base hits on the year. Teams are hitting .263 against the Tigers bullpen while being struck out 333 times and walking 129 times this season. As a team, Detroit has allowed 9.07 hits per nine innings while striking out 7.43 batters per nine. They are 18th in the league in team earned run average at 4.24. The Tigers pitchers as a team have surrendered 1,138 base knocks and 532 earned runs so far this season. They have given up 140 home runs this year and they give up 1.1 home runs per nine innings as a staff. Detroit as a staff has walked 358 hitters and struck out 933. They give up a walk 2.9 times per 9 innings while they strike out 7.4 per 9. Their team WHIP is 1.32 while their FIP as a staff is 4.16. As a team, they are batting .267, good for 4th in the league while putting together a .271 average at home. The Tigers hold a .436 team slugging percentage and an on-base percentage of .327 which is good for 9th in baseball. They rank 5th in baseball with 9.2 hits per contest. Miguel Cabrera comes into this matchup batting .311 and he has an OBP of .385. He has 147 hits this year along with 71 runs scored and 80 RBI. He's struck out 93 times and has walked on 56 occasions. 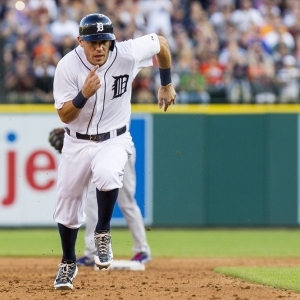 Ian Kinsler is hitting .275 and he has an OBP of .336. He has collected 139 hits so far while he's scored 94 runs and drove in 65. He has earned a walk 36 times and has punched out 99 times. The Tigers as a unit have 1,168 base hits, including 192 doubles and 167 homers. They have 51 stolen bases while they've been thrown out 20 times. Detroit as a team has walked 375 times this year and they have struck out 1,026 times. They've had 860 men left on base and have an OPS of .764. They score 4.69 runs per game and have totaled 596 runs so far this season.